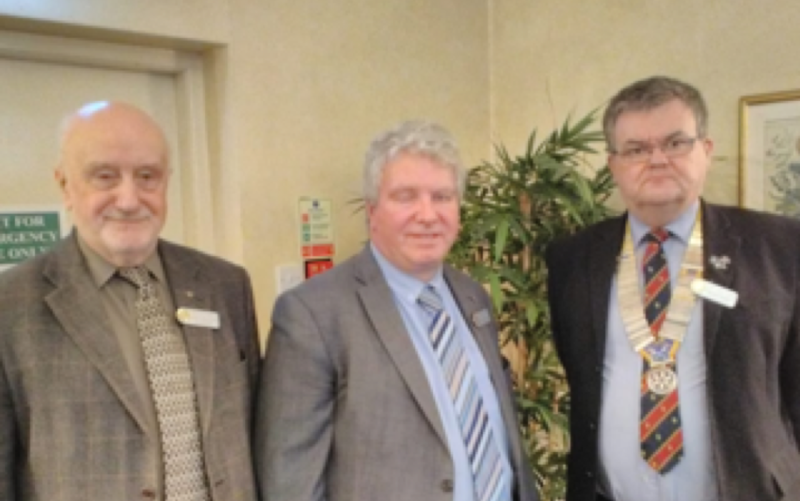 Recently recruited member, the Reverend Richard Baxter, entertained the Lochaber Rotary Club at its business lunch meeting on 28 March with a rapid 10-minute talk on his diverse and intriguing journey through the jobs environment. Richard is a native of Northern Ireland and moved to Scotland to take a degree in history, an interest that led him to research the history of English alehouses! However, the ‘real world’ beckoned and he soon found himself working for HMRC as a tax inspector in Edinburgh then Kirkcaldy, following which he joined an accountancy practice in Edinburgh as a consultant. After 5 years in this world of tax accountancy he realized he was not entirely happy with the ethos of this tax world and, with his wife’s encouragement, and giving up his regular salary, he spent 3 years training as a minister. On graduating, Richard’s first posting as a minister was to the linked parishes of the Fife villages of Kennoway and Windygates where he spent a busy and happy 19 years working in, and administering to, the needs of these two “great communities” with their contrasting backgrounds and cultures . In April 2016 Richard was appointed to the post of minister at the Duncansburgh MacIntosh Church in Fort William linked with Kilmonivaig Church at Spean Bridge. The area encompasses Roybridge and stretches to Loch Laggan and Corrour to the east and South Laggan to the north – an extensive mix of urban and rural life. Richard described this parish as a really interesting area with a wide variety of people and issues and added “I do what I can to make this congregation open and welcoming and I value my link to Rotary. It’s nice to be part of the good work of Rotary but, unlike the church, not have the responsibility of organizing it ! I love my job and I love the ‘short commute’ to work ! I very much enjoy living and working in this community and look forward to being part of the Club”. 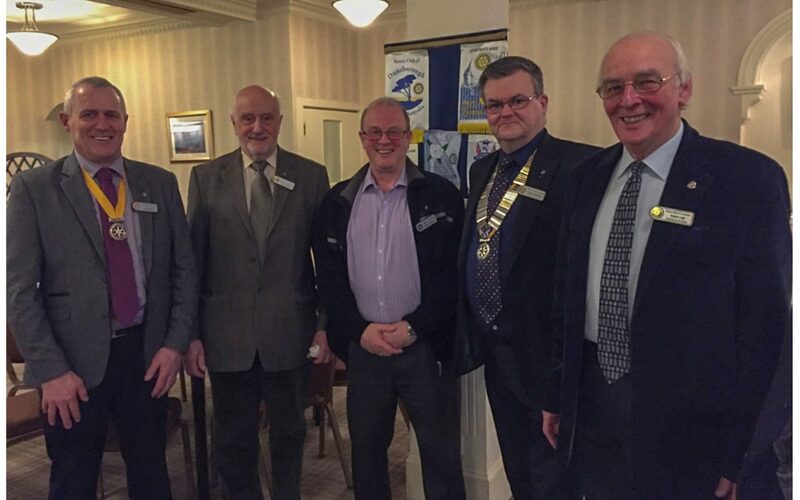 On behalf of the Club, President Donald McCorkindale said he was delighted to welcome Richard and said “with the experience you bring to the area and with our shared commitment to Rotary and Lochaber, it’s good to have you involved”. At the Club’s business lunch meeting on 21 March, our newest member Simon Hardiman, delivered a highly interesting summary of his life and times, starting as a 14-year old butcher’s assistant, ranging through postings to West Germany , Hong Kong and the Falklands, and culminating in his current position as proprietor of the Coire Glas Guest House in Spean Bridge. Born in Stourport-On-Severn in Worcestershire, Simon ‘s family moved to Kidderminster and then to Paignton where he completed his secondary education and gained an OND in business studies. Whilst studying Simon also held down two jobs – working at a bookmaker and as a theatre stagehand. On finishing college Simon joined the Midland Bank progressing to Head Cashier in its Newton Abbott branch before moving to join Post Office Counters as a Counter Clerk, a post which leads eventually to him taking over the Head Office Cash Account for Torbay. Whilst in this post Simon applied for a secondment to the Royal Engineers Postal and Courier Services as an officer and, after a successful interview process, involving two four day assessments, Simon “eighteen months later walked into Mill Hill Barracks North London on the 18th February 1985 as Second Lieutenant Hardiman prior to attending the Royal Military Academy at Sandhurst”. Simon continued “On leaving Sandhurst I was initially posted to BFPO London at Mill Hill where I took over the duties as an accountant before being posted to Herford in West Germany as second in command at 14 PC Squadron. After a successful tour, I was promoted first to Lieutenant and then to Captain before a posting to Hong Kong for 2 years followed by a posting to Cirencester Gloucestershire with 10 PC Squadron. Whilst there I was posted to the Falkland Island as the OC Falkland Island PC Troup for 4 months”. Simon then returned to South Cerney near Cirencester, before moving back to London “to run half of BFPO London during the first Gulf War”. Simon added “I was due to go out to Kuwait and take over the main depot as an acting Major when the war ended and it was decided to leave the chap out there to wrap it all up. It was at this stage I decided on a career change and joined the Metropolitan Police in late 1992”. This resulted in Simon being based in Edmonton for the next 17 years, a busy police station. In 2009 he left the police force and worked as a taxi driver at Stanstead Airport for the next 4 years. In 2015 he started work as a senior team leader at a manufacturing company based in Huntingdon where he then lived. For a number of years, Simon and his wife Morven had travelled to Scotland for a December holiday and had talked about possibly buying a B & B to run. Last June that dream became a reality when they purchased Coire Glas Guest House in Spean Bridge and led to him joining the Rotary Club. On behalf of the Club, Robbie Robertson thanked Simon for his very full and entertaining talk. Robbie said he was confident that Simon had all the right credentials and attitude to be a Rotary member and welcomed his membership. Club members responded with hearty applause.